This amazing riflescope combines a flexible magnification range with a high-resolution 44mm objective lens to create one of the most highly demanded riflescopes ever engineered. Scope includes an easy-to-reach side focus parallax adjustment for an unmatched sight picture from any shooting position. The various aiming points built into the BDC reticle can be utilized with Nikon’s Spot On Ballistic Match Technology to give you exact aiming points at various yardages. Take the guesswork out of figuring elevation and bullet drop compensation. To simplify field adjustments, Nikon has integrated this feature into all MONARCH 3 Riflescopes. Just sight in at 100 yards as usual, then lift the adjustment knob, rotate to your “zero”, and reengage. Nikon has engineered the entire optical system to provide the shooter with a bright, sharp and incredibly flat sight picture and light transmission up to its theoretical maximum- 95% for clear sight picture form dawn to dusk. The MONARCH 3 line is optimized for use with Nikon Spot On Ballistic Match Technology. Spot On allows you to discover all of the exact aiming points on the BDC reticle for your exact ammunition and load. Reticle adjustments are made in 1/8 MOA click-stop moves you can both feel and hear, and with no backlash to make your shot creep off target. Positive click reticle adjustments get you zeroed in quicker and maintain your setting—even with repeated recoil and under rugged conditions. 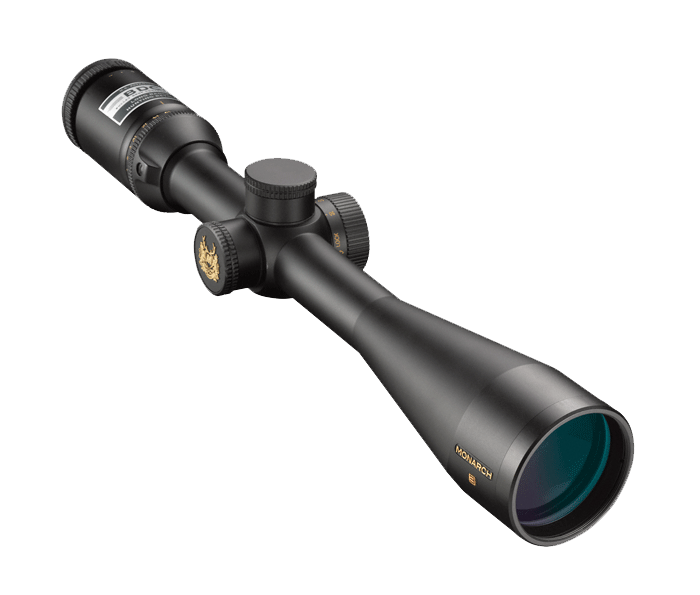 Engineered for minimum weight and maximum strength and durability, Nikon builds these scopes from aircraft grade aluminum alloy and utilizes larger internal lenses for maximum resoloution. Larger tubes allow for the best resolution, wider windage and elevation travel, and superior low-light performance. Provides greater mounting versatility. Most MONARCH 3 models can be mounted to virtually any rifle action regardless of caliber- even magnum-length actions. Keeps your brow safe—even with the heaviest recoiling cartridges, lightweight rifles, and severe shooting angles. Every model features an impressive 4-time zoom range and up to four inches of non-critical eye relief. A massive ocular lens delivers a huge, exceptionally bright, high-resolution sight picture. Nitrogen filled and O-ring sealed for confidence under any conditions. Magnification reference numbers are viewable from the shooter’s position, making adjustments in the field quick and precise. <b>Full Lifetime Warranty</b><br/>Nikon stands behind its products by offering the best consumer protection in the shooting sports industry.